Asexual blood stage Blood stages show a small decrease in the growth rate in mice. Fertilization and ookinete Normal gametocyte production. The ookinete production in Anopheles stephensi mosquitoes was reduced by 30-40% as compared to wild type parasites. Ookinetes had a reduced capacity to develop into (mature) oocysts. Oocyst Ookinetes had a reduced capacity to develop into (mature) oocysts. At two days after feeding of mosquitoes the number of young oocysts (stained with anti-P28 antibodies) was reduced by 70-90% when compared to wild type. At day 12 after feeding the oocysts numbers were reduced by 65-85%. Day 12 oocysts were significantly smaller than wild type oocysts and no formation of sporozoites was observed. The mutant lacks expression of gamma-glutamylcysteine synthetase (γ-GCS). γ-GCS catalyzes the rate limiting step during GSH biosynthesis. GSH is a thiol-based tripeptide implicated in a variety of cellular processes, including detoxification of xenobiotics and protection against reactive oxygen species (see also 'Additional information'). The phenotype analyses indicate that γ-GCS is not essential for blood stage development. Despite a significant reduction in GSH levels, blood stage forms of mutant parasites showed only a minor defect in growth as compared to wild type, resulting in a small growth delay in mice. In contrast, a dramatic effect of the lack of expression of γ-GCS was observed on development of the parasites in the mosquito. Infection of mosquitoes resulted in reduced numbers of stunted oocysts that did not produce sporozoites. These results indicate that de novo synthesis of GSH is pivotal for development in the mosquito. GSH levels have been analysed by HPLC in blood stages of wild type and mutant parasites. Glutathione levels were significantly reduced (P<0.001) the mutant parasites (0.2-1.0 nmol/109 parasites) as compared to wild type parasites (7.4 nmol/109 parasites). γ-GCS catalyzes the rate limiting step during GSH biosynthesis. GSH is a thiol-based tripeptide implicated in a variety of cellular processes, including detoxification of xenobiotics and protection against reactive oxygen species. In most eukaryotic organisms, redox-active enzymes, such as catalase, superoxide dismutase, and peroxidases as well as an enzymatic cascade that generates reduced electron donors, i.e. glutathione (GSH) and thioredoxin (Trx), sustain the cellular redox homeostasis. This redox network is split into two major arms, the GSH and the Trx system, that serve complementary functions in antioxidant defense and DNA synthesis. The malarial parasite Plasmodium lacks two central antioxidant enzymes: (i) catalase that typically detoxifies hydrogen peroxide and (ii) a classical glutathione peroxidase, a selenoenyzme that reduces lipid hydroperoxides to their alcohols. This apparent deficiency raises doubts about the relevance of the glutathione (GSH) pathway in detoxification of oxidative stress in Plasmodium. However, supportive of a role for GSH metabolism in the detoxification process are the observations that the P. falciparum glutathione S-tranferase enzyme, which conjugates GSH to other molecules via the sulfhydryl group, displays peroxidase activity. Evidence has been presented that P. falciparum does not utilize GSH from the host red blood cell since the parasite membrane is neither permeable to host GSH nor γ-glutamylcysteine. 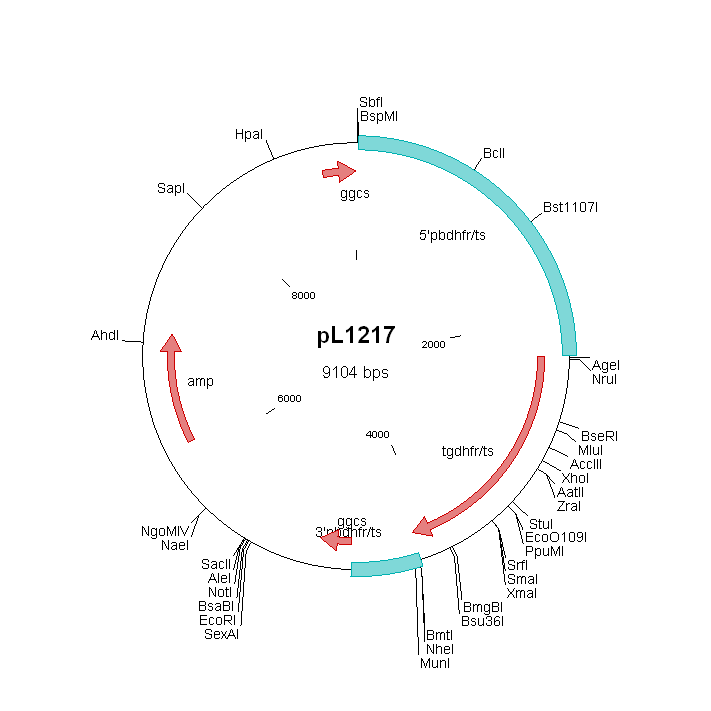 Plasmodium is therefore thought to be dependent on its own GSH biosynthetic pathway. GSH is synthesized in Plasmodium by consecutive reactions facilitated by the enzymes γ-glutamylcysteine synthetase (γ-GCS) and glutathione synthetase (GS). However, it has been hypothesized that host GSH can be transported into the P. berghei food vacuole via hemoglobin-containing endocytic vesicles, based on data showing that GSH can detoxify the toxic ferriprotoporphyrin IX inside the parasite's food vacuole. RMgm-403, RMgm-404: Mutants lacking expression of glutathione reductase (GR).